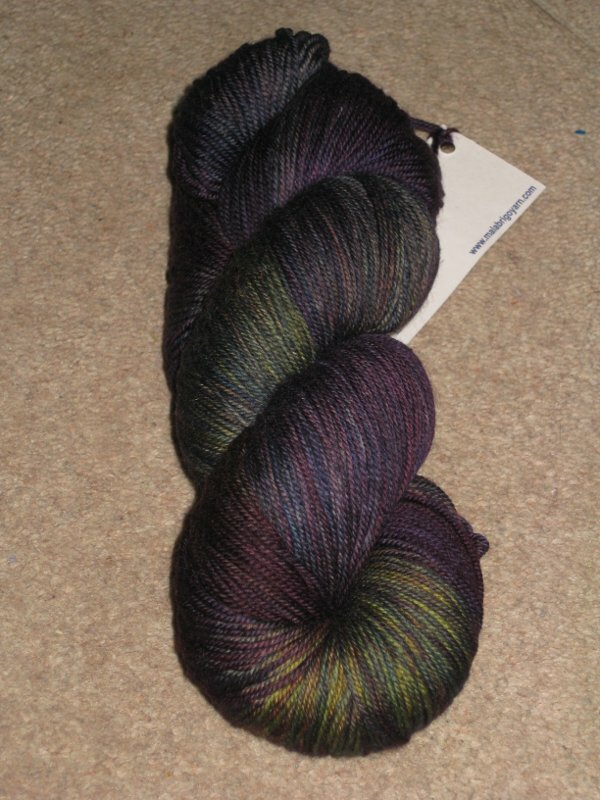 …Malabrigo, and a shawl from Strickmitt! Thanks to Beks for the inspiration. I got the ebook with four shawls in and I’ll have a look and decide which one I’m actually going to knit. A few days camping, then a few car journeys and staying with people. The big question is what to knit. Space is limited, so I really need to pick one project. It can’t be fiddly and it needs to be able to stand being dropped at any point so I can run and rescue the little girl from whatever mischief she has got into. Next in my queue I have Color Affection, but I utterly refuse to take cashmere on a camping trip. Here’s my queue. Anything catch your eye? I’m wondering about Shogun. 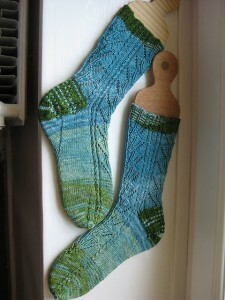 I posted last at the end of May and, since then, my needles have been busy with socks. It is the annual Tour de Sock competition: six stages of socks, usually of increasing difficulty. 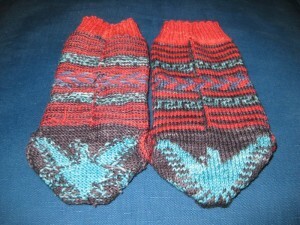 The socks are released at intervals of ten days and it is something of a speed knitting competition. Knitting quickly is not my strong point, mainly because knitting time is stolen from other things I should be doing like feeding or playing with the children, working, or spending time with the husband. I did get some time away on a conference, and found that when I can knit for several hours a day, more knitting appears. Who would have thought? Here’s the report so far. Stage 1: The Secret Fan – completed, but not within the time limit. You can see on the left the small amount of beading that was involved in this round. The yarn was a Take Five set from The Knitting Goddess, that I’ve had kicking around in the stash for years. 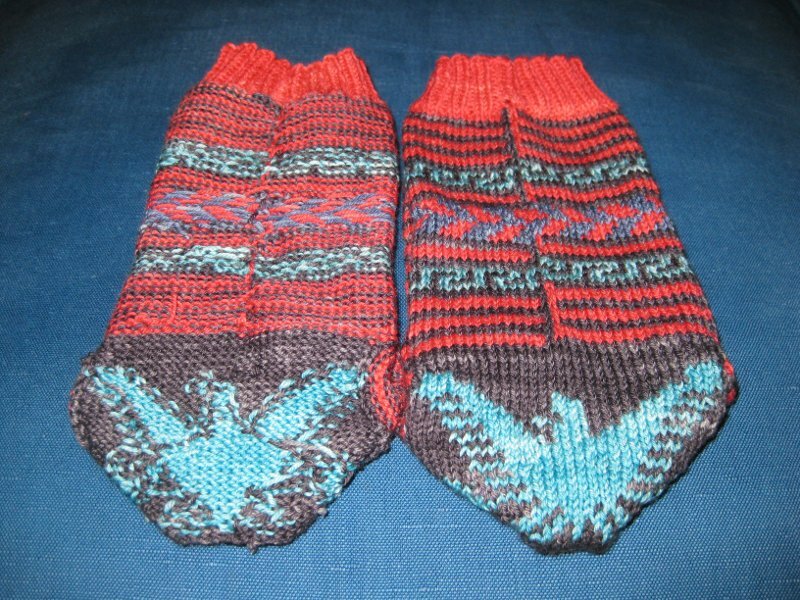 I’m fairly pleased with them, but probably should have alternated the colours for a few rows when changing them. Stage 2 – Did not start. 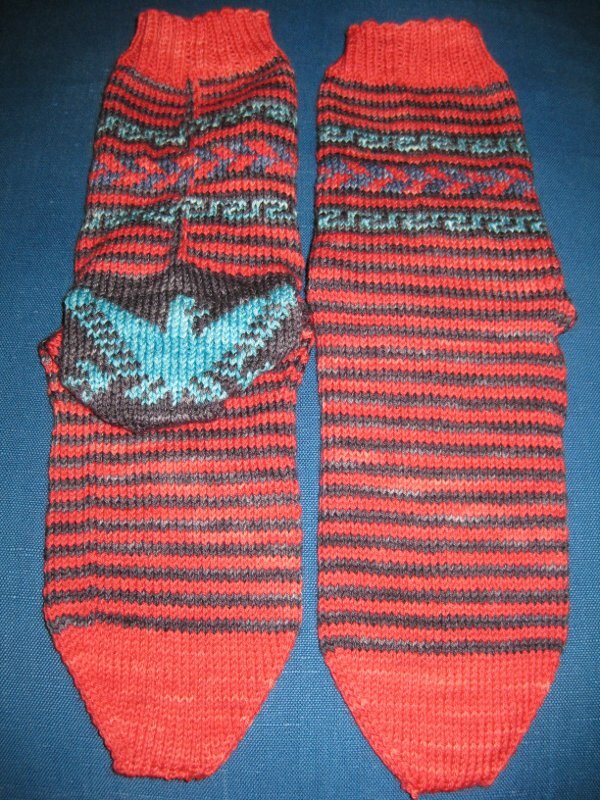 This was a pair of socks with some cables and some simple colourwork and I just didn’t fancy it, plus I still had the stage 1 socks to finish. 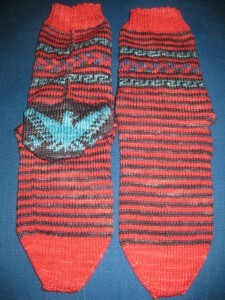 These socks had three different types of colourwork in them: mosaic, fair-isle and intarsia, plus stripes. I’ve never got the hang of intarsia, and the whole point, for me, of these competitions is to master new things, so I jumped in. 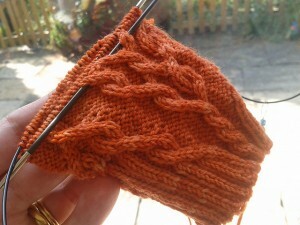 Turns out that intarsia isn’t too hard, although I am not totally happy with some of the tension in the stitches. Still, I learnt something new and finished the stage on time.The yarn was more Knitting Goddess sock yarn, using up some single skeins left over from previous colourwork socks. I’m nearly out of semi-solids, so will need to go shopping before I do any more like this. Stage 4 – did not start. I needed a break from knitting socks and I really couldn’t face adding 500 beads to a sock, having established last year that beaded socks are uncomfortable to wear! Stage 5: Little Deschutes. In progress, will not be completed within time limit. Travelling cables. 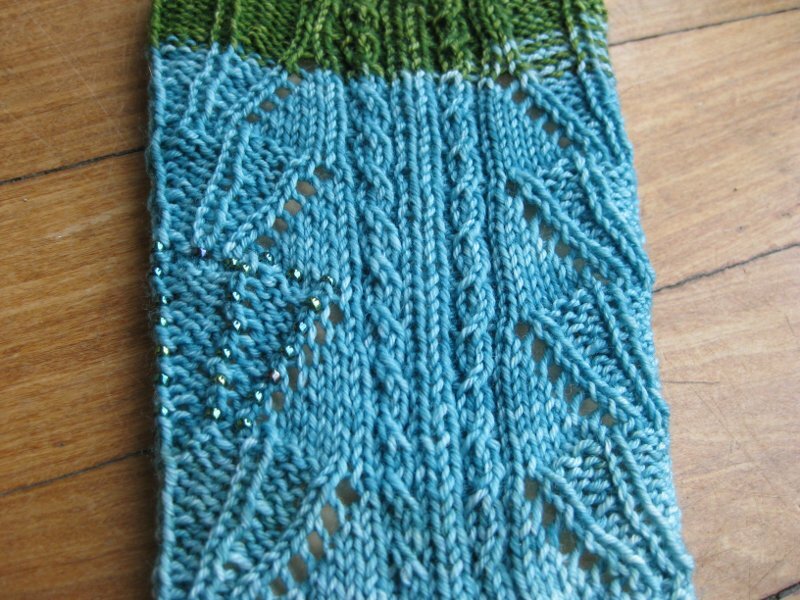 A gorgeous pattern, which is very relaxing, but not quick, even having mastered the art of cabling without a cable needle. The main reason I haven’t got further with these is that I have got seriously into watching the Tour de France, to the extent that I concentrate on it without knitting. All three of these pairs have been knitted with my new Karbonz circular needle that I won in a contest on Sanday Spinners. Here is the review I sent to them. As you can tell, I’m a big fan of the Karbonz needle. It is so smooth and easy to use. I’m even a convert to magic loop, having stuck to using 2 circulars for the last few years. 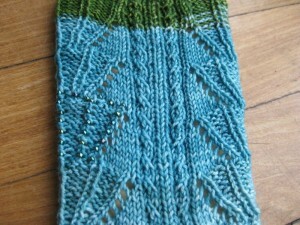 There’s just Stage 6 of Tour de Sock left to go. It’s usually a bit of a challenge. This year it calls for yarn that is: “Striped, Long Gradient Color change, or leftovers/minis.” There is great speculation on the discussion board over what it will be.